This blog entry was first posted on January 7 2012, and revised and republished on August 31 2016. 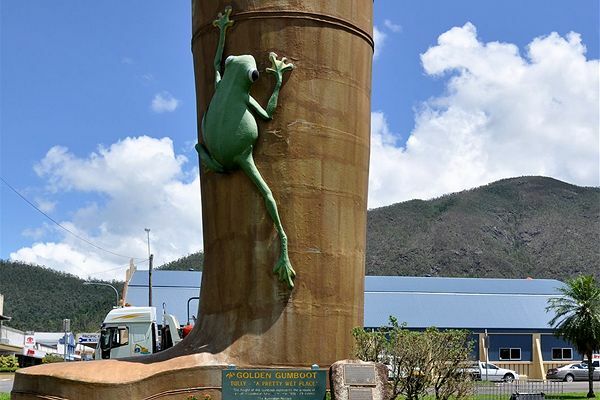 On January 3, the town of Tully in Queensland celebrated the upgrade of its famous Golden Gumboot, which was damaged by Cyclone Yasi nearly a year ago. The tourist attraction is a 7.9 metre (26 feet) high gumboot, painted gold, built to commemorate the town’s 1950 highest recorded annual rainfall level of 7.9 metres (310 inches), earning Tully the distinction of being Australia’s wettest town. When the Golden Gumboot was re-opened, it had received a fresh coat of paint and a new viewing platform. Fittingly, it rained heavily throughout the ceremony. The town of Tully is named after the nearby Tully River, which received its name from Surveyor-General William Alcock Tully. William Tully was originally from Dublin, and arrived in Hobart as religious instructor on a convict ship in 1850 before embarking on a career of conscientious public service. Tully is an Anglicised form of an Irish surname, originally MacTully, and having a host of variants, which is often derived from tuile, the Gaelic word for “flood”. Another theory is that it has been mistranslated from toile, meaning “will” (as in the will to keep going). However, some Tullys are so convinced of the first interpretation that they have hyper-Anglicised their surname to Flood. The meaning of “flood” is very appropriate for the name of a river, and a town famous for its sogginess. In Game of Thrones, the Tully family is one of the Great Houses and as it is the principal house in the Riverlands and their ancestral home is Riverrun, perhaps George R.R. Martin also had the Irish surname and meaning in mind. Tully has been used as a personal name since the late 18th century. Although the name can be found in early records from Ireland, it seems to have been more frequently used in the United States. One inspiration for it may have been the Founding Father Alexander Hamilton, who wrote patriotic pamphlets under the pen name Tully – in his case, a reference to the Roman philosopher Marcus Tullius Cicero, whose name was occasionally Anglicised to Tully. The Tullia took their surname from the legendary Roman king Servius Tullius; the name is so ancient we do not know its meaning. Tully has never been a common name. Last year in the US there were 8 boys named Tully with no girls listed with the name since 2013. In the UK the name has been in sporadic use, and in 2014 there were 4 baby boys named Tully. No girls are listed as having been given the name since 2009. In Australia I have seen a roughly equal number of boys and girls with this name, and the name may be more evenly unisex here than elsewhere. One boost to the name for girls is women’s basketball champion Tully Bevilaqua, and after the attractive but controversial Tully Smyth competed on Big Brother in 2013, I heard many Australian parents refer to Tully as a “girl’s name”. Perhaps more importantly, it fits with the Australian trend for female names with a T-L pattern, such as Talia, Tilly, and Tallina. The town of Tully was one of the worst affected by Cyclone Yasi, which hit the coast of northern Queensland early in the morning on February 3 2011. The town suffered extensive damage to its main street, and the area’s banana crops were completely flattened. Because Cyclone Yasi originated in Fiji, it was a Fijian cyclone forecaster called Misaeli Funaki who chose its name. If you think naming a baby is difficult, spare a thought for the meteorologists who name cyclones. The cyclone had to start with Y, and nobody could think of an appropriate name for either gender. So Mr Funaki suggested Yasi, which is the Fijian word for “sandalwood”. It didn’t have a history as a personal name in Fiji, but with no other candidates, his nomination was accepted by the ruling UN body. And so a new name was created. Sandalwood is a tree with fragrant wood native to Asia and the Pacific. Australia has a sandalwood industry; the tree’s oil is used to make incense, soaps and cosmetics. Its antibacterial properties make it excellent as a skin cleanser, and Australian Aborigines eat its fruit as a bush food. Sandalwood is also used in the rituals of several eastern religions. Yasi is neither used for boys or girls in Fiji. The cyclone forecasters were looking for a male name when they chose it, but they often resort to unisex names, and probably meant Yasi to be one. It’s commonly said to rhyme with Darcy, but seems to be more correctly pronounced YAH-zee. During Cyclone Yasi, one doctor was apparently very keen for all babies born during the cyclone to be named Yasi, but there is no record of anyone following his advice. However you can find people around the world with the name Yasi, mostly female – perhaps a short form of names such Yasmin. These are two short unisex names important to Australia’s history, especially connected with Queensland, rain, and storms. Tully is uncommon, but not unheard of, while Yasi is a true rarity, but not unusable. Tully received a very good approval rating of 70%. 46% of people thought it was a good name, while not one person hated it. Yasi was far less popular, with an approval rating of 22%. 53% of people weren’t keen on the name, and only one person loved it.